FOR THE 2019 SEASON, Scenic Emerald has been chartered by Noble Caledonia and operates under the name Royal Emerald. The Scenic Emerald measures 442 feet in length and carries 169 guests and a crew of 48. 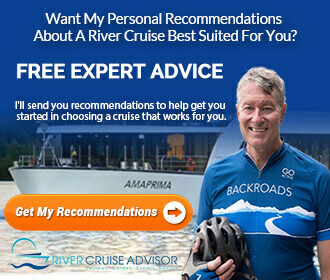 Unlike some river cruise ships, Scenic Crystal offers full, step-out balconies for nearly all staterooms in place of more traditional French balcony staterooms, plus a new feature called the Scenic Sun Lounge. All Scenic Tours Space Ships offer full, step-out balconies in place of more traditional French balconies. Photo courtesy of Scenic Tours. Category D and E Staterooms are located on Moselle Deck, the lowest accommodation deck on board, and feature windows that do not open. They measure 160 square feet. Category BS is designed for Solo travellers. Measuring 129 square feet, this stateroom (#224) is located on Rhine Deck and features a full step-out balcony. Categories BD, BA and C all measure 205 square feet and are located on Rhine Deck. They feature full step-out balconies. Category BJ is a Junior Balcony Suite featuring a full step-out balcony. It measures 250 square feet and is located on Rhine Deck. Categories PD, PA and A are all located on Danube Deck, the uppermost accommodations deck. They measure 205 square feet, and all feature full step-out balconies. 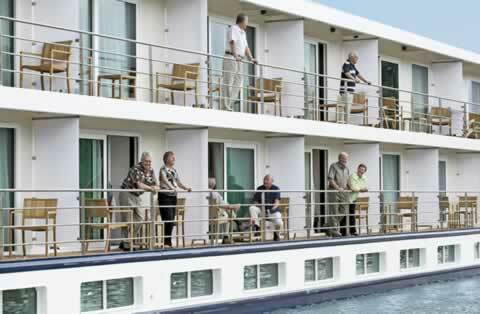 Category S is a Panorama Balcony Suite situated all the way aft on Danube Deck. These two suites have 180-degree views of the ship’s wake and side, and measure 250 square feet. Category RJ suites also measure 250 square feet, but are located along the port and starboard sides of Danube Deck. Category RA suites, or Royal Suites, are located on Danube Deck and measure 300 square feet. There are two of these suites, numbers 316 and 317. Category R suites are also Royal Suites located on Danube Deck, but are slightly larger than Category RA suites at 315 square feet. There are two of these suites, numbers 314 and 315. All staterooms feature flat-panel televisions, wireless internet access, L’Occitane bath amenities, plush bathrobes, and Scenic’s own “Scenic Slumber Beds,” featuring crisp Egyptian linens. A mini-bar, hairdryer and personal safe are also included in every stateroom. The Panorama Lounge and Bar is situated all the way forward on Danube Deck and features floor-to-ceiling windows that allow for spectacular views of the passing scenery; a distinguishing feature of river cruising. 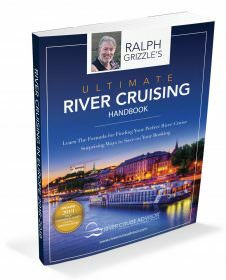 Two Restaurants offer guests more dining choices than on some river cruisers. The Crystal Dining Room is situated forward on Rhine Deck and serves up elegant fare in a comfortable setting, while Portobello’s Restaurant occupies the forward space of Danube Deck, and is flanked by the comfortable Observation Lounge. An outdoor Sun Deck occupies the uppermost deck of the ship and features plenty of space for scenic viewing, in addition to an Open-air Lounge and a Walking Track. A Gift Shop and Fitness Center round out the mix of amenities available on board. Read other articles about the Scenic Emerald.